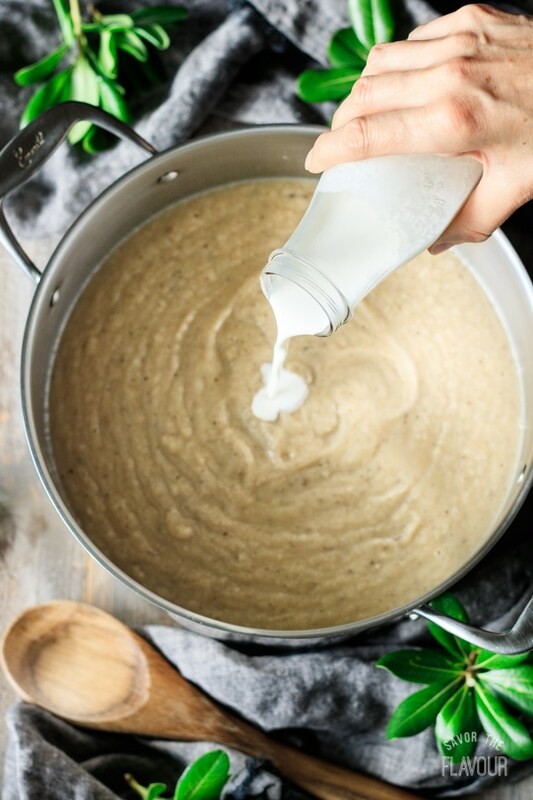 Creamy roasted cauliflower soup is a creamy gourmet soup that’s loaded with vitamin C. It’s simple to make, low carb, and healthy. 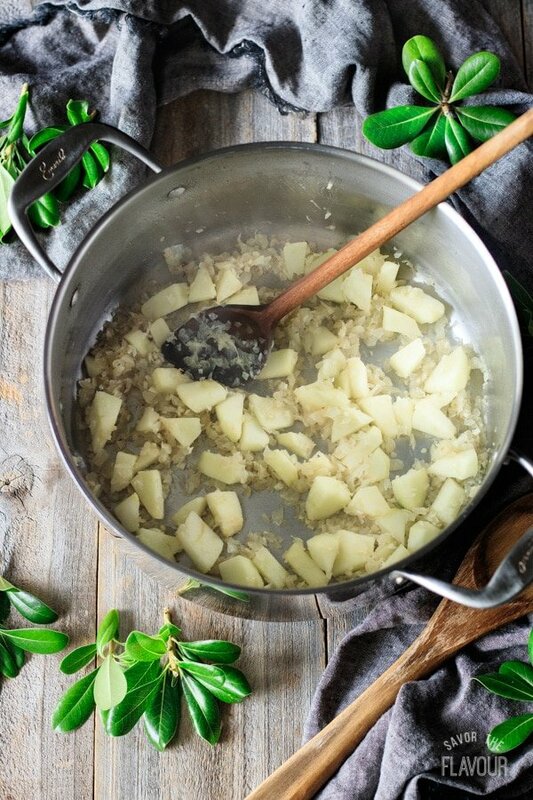 Enjoy this comfort food as the ideal gluten free meal for cold fall and winter days. 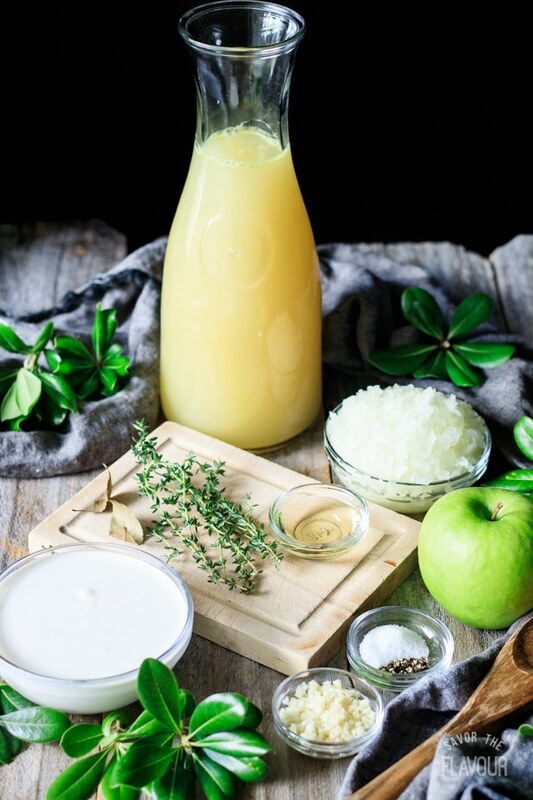 Are you looking for a healthy comfort food recipe? 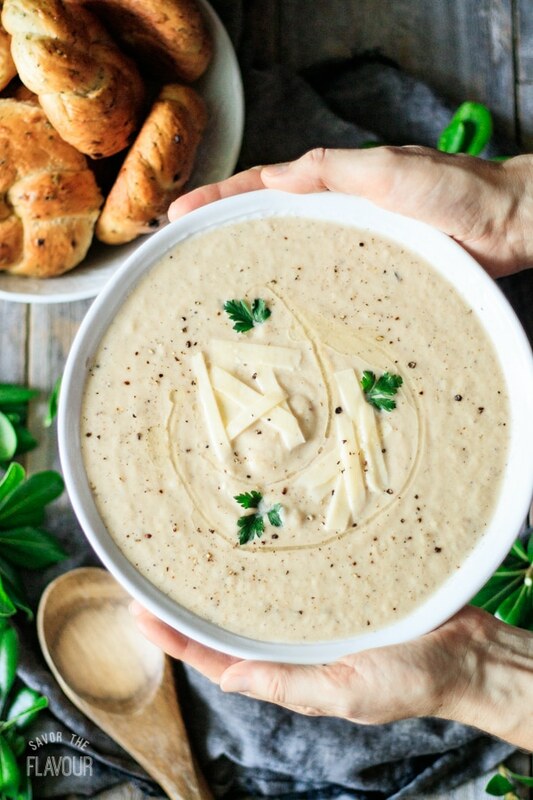 Creamy roasted cauliflower soup is low in carbs, gluten free, and high in vitamin C. Since cauliflower has been advertised as a superfood, you know you should eat more of it. It’s high in fiber and water to help with digestion. It’s low in calories and high in water, so it can assist with weight loss. It’s a plant based source of choline, an important nutrient for the nervous system. 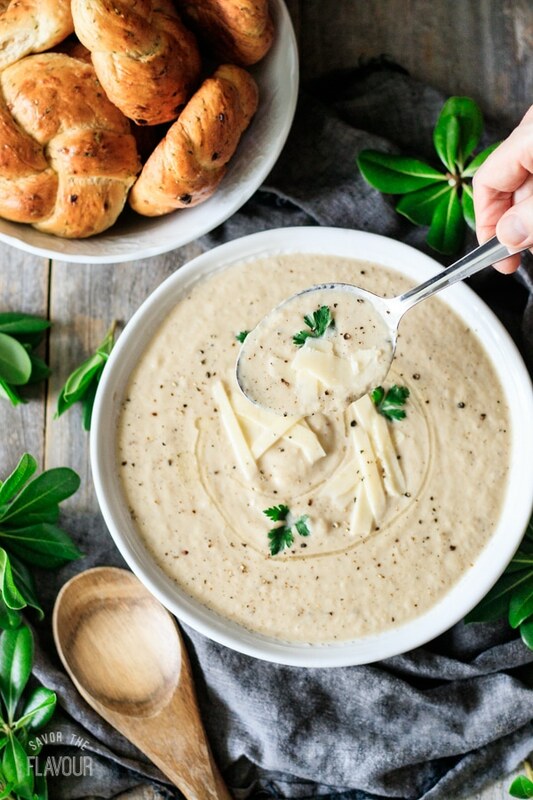 What spices go well with cauliflower soup? Start by cutting 2 heads of cauliflower into florets, then rinse and drain them. 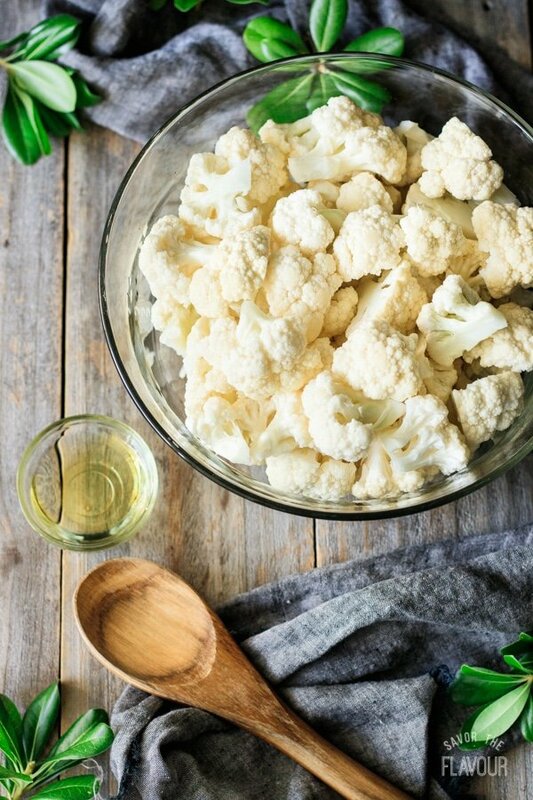 Pour 2 tablespoons of olive oil over the cauliflower and toss until well coated. Line two cookie sheets with aluminum foil, then brush with olive oil. 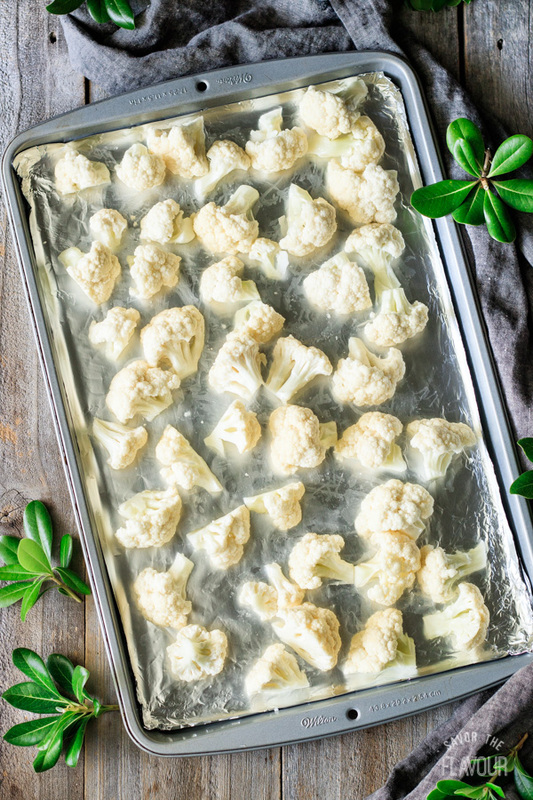 Spread the cauliflower evenly over the trays, then roast for 20 minutes at 400 F.
While the cauliflower is roasting, prep the rest of the ingredients. Peel, core, and chop the apple, mince the garlic, and chop the onion. 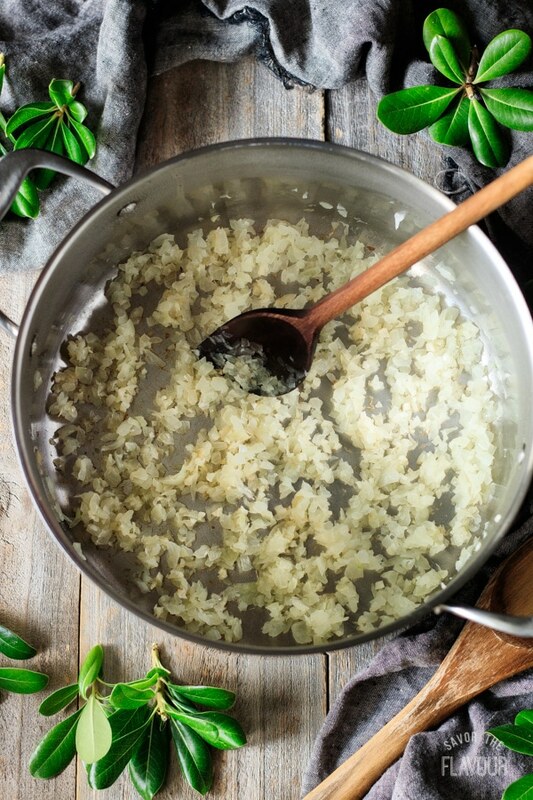 Sauté the onion and garlic in olive oil. Add the apple and cook for a couple of minutes. Pour in the chicken stock, then add the roasted cauliflower, fresh thyme, bay leaves, salt, and pepper. Cover and bring to a boil, then simmer for 20 minutes. Puree the soup in small batches using a blender or food processor. 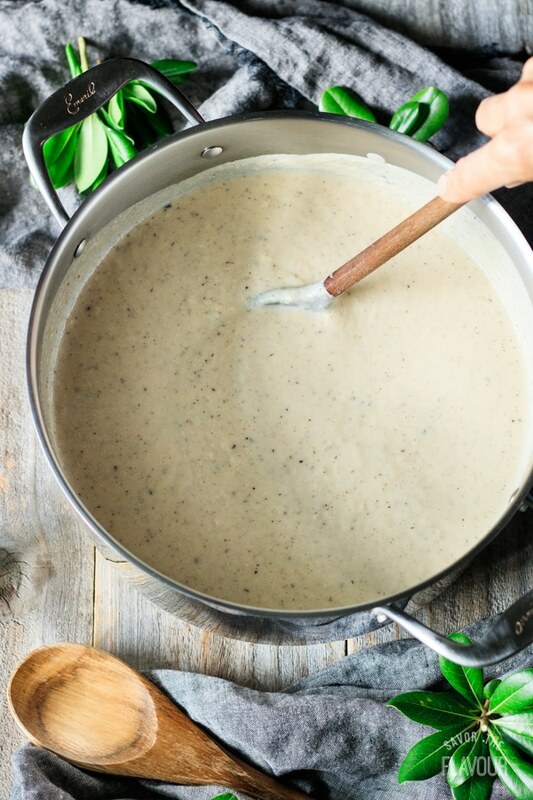 Return the soup to the pot and set over medium heat, then pour in the cream. Stir well until all the cream is thoroughly mixed. Cook until the soup is heated through, roughly 5 minutes, but be careful not to let it boil. Garnish with a drizzle of olive oil, parsley leaves, freshly ground black pepper, and Asiago cheese chards or Smoked Gouda cubes. Serve hot with these garlic and Asiago twists. If you make this ahead, wait to add the cream until just before serving. 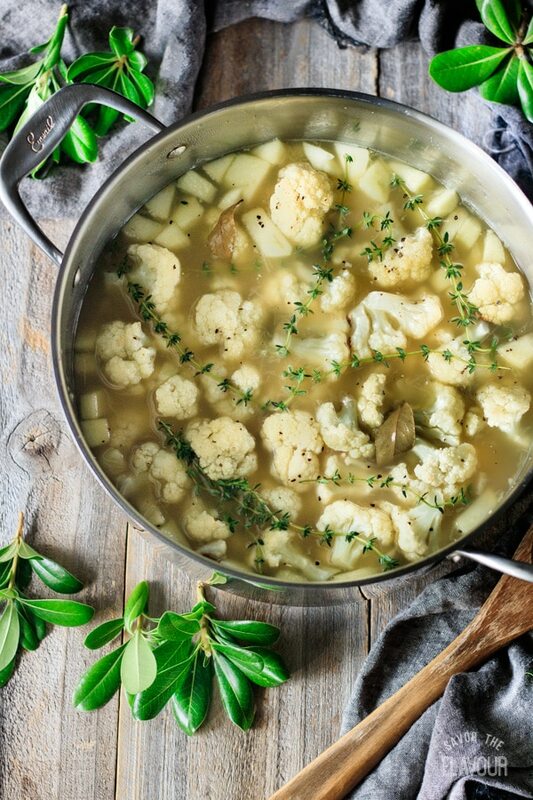 Garnish the soup with 1 cup of roasted cauliflower florets. No roux is needed to thicken the soup; the pureed cauliflower does it instead. Roasting the cauliflower gives it a caramelized note and a depth of flavor. Try other garnishes like green onion, chives, cherry tomatoes, roasted chickpeas, or garlic croutons. Substitute half and half, whole milk, or coconut milk for the heavy cream. If you like, add nutmeg and lemon juice at the very end. 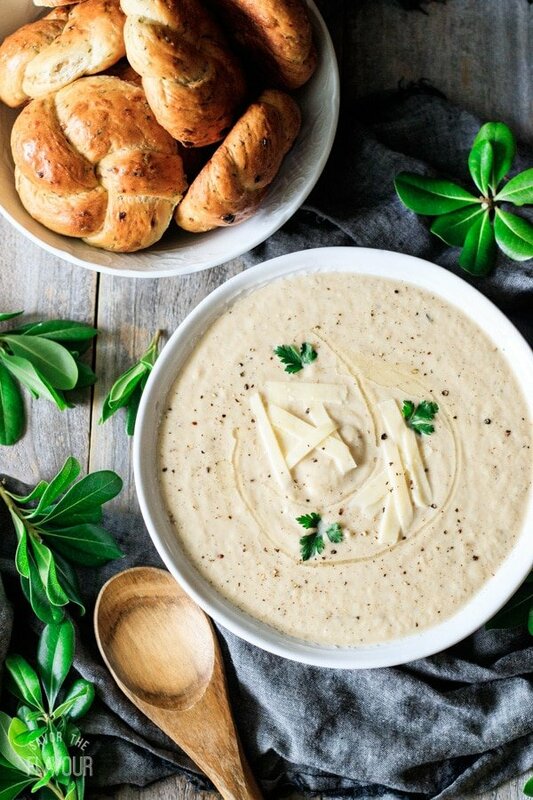 Enjoy this gourmet creamy roasted cauliflower soup as an ideal gluten free comfort food on those cold fall and winter days. Check out these other healthy veggie recipes to help you lose weight this fall and winter. 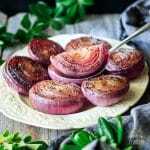 Make Ahead Marinated Red Onions: a super easy side dish that’s perfect for an elegant meal. 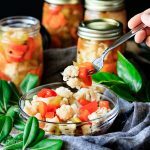 How to Make Giardiniera: pickled cauliflower is the main ingredient in this delicious tangy condiment. 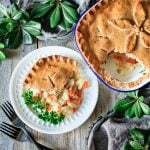 Woolton Pie Recipe: this British WW2 rationing recipe uses cauliflower and other garden veg. 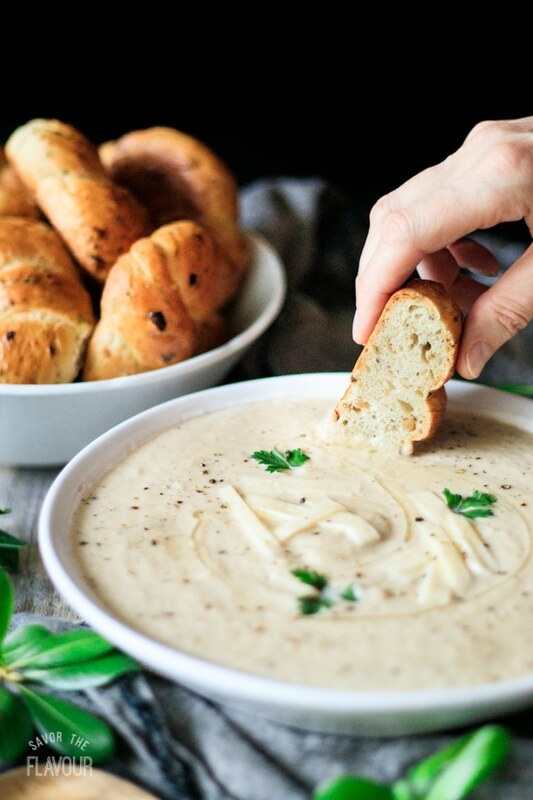 Did you make this roasted cauliflower soup? Please leave a star rating below to share how you enjoyed it. Preheat the oven to 400 F. Line two large cookie sheets with aluminum foil, then brush them lightly with olive oil. While the cauliflower is roasting, saute the onion in 1 tablespoon of olive oil over medium high heat for 5 minutes, stirring occasionally. Add the garlic and saute until fragrant. Add the apple and cook for 2 minutes. Pour in the chicken broth, then add the cauliflower, bay leaves, salt, black pepper, and fresh thyme sprigs. Cover and bring to a boil, then reduce the heat to medium low and simmer for 20 minutes. Remove the bay leaves and thyme sprigs. 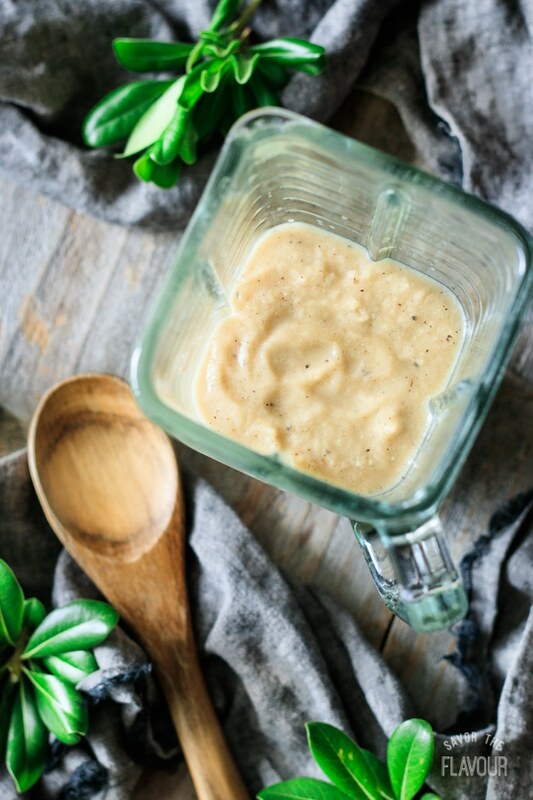 Puree the cauliflower soup in a blender or food processor in small batches. Be careful not to burn yourself. Return the pureed soup to the soup pot and turn the heat to medium. Add the heavy cream and stir until well combined. If necessary, add more chicken broth to thin the soup. Heat through for 5 minutes, then taste and adjust seasonings if necessary. Garnish the soup with a drizzle of olive oil, fresh parsley leaves, Asiago shards, or smoked Gouda cubes, and freshly cracked black pepper. Serve hot with garlic and Asiago twists. This soup will keep in the fridge for up to four days in an airtight container, or in the freezer for up to three months. To make this vegan use vegetable broth, coconut milk and omit the cheese for the garnish.